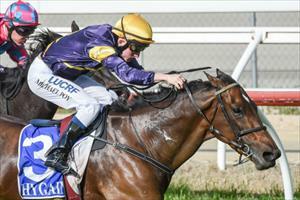 Louisville Lip is the only runner for the stable on Saturday when he travels to Moonee Valley. The last start winner runs in race four, the Inglis Catalogues Out Now Handicap over 1500m with Jordan Childs to ride. Louisville Lip won his last start at Kilmore over 1612m on October 23 and Mike Moroney and the team at home have been working on the geldings barrier manners. “We’re really happy with the horse and the way he is going,” Moroney said. “We’ve just had these little barrier issues with him that we’ve been working on. “He’s drawn out and there is not much of a run to the first turn from the 1500m start so we will likely aim to ride him back and then run on - he’s relaxing in his races now and we don’t want to undo all that by riding him forward. Rhythm To Spare was also an intended runner at Moonee Valley but was scratched from his race on Friday.